Mix bread crumbs, onion, garlic, parsley, red pepper, thyme, and fennel seed in bowl. Mix ground turkey with egg whites in large bowl, and add seasoned crumbs. Knead mixture well. Cover and chill meat 10 minutes. Preheat broiler. Split squash in half. Remove seeds. Place in glass baking dish, cut side down. Add 3 to 4 tablespoons water. Microwave on HIGH 10 to 12 minutes, or until fork-tender. Set aside to cool. 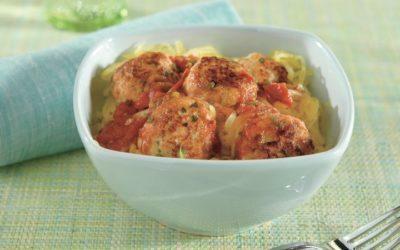 Form 20 meatballs with chilled turkey. Put meatballs on pan; broil 4 to 5 minutes. Remove pan, turn meatballs, and cook 4 minutes more. Mix tomatoes and broth in 12-inch skillet; simmer over low heat. Add meatballs, oregano, basil, and green onions. Stir and cook until hot, about 10 minutes. 4. Scrape squash into strands onto serving plate. Top with sauce and meatballs.